“Sleep is very important in healthy times, but in times of illness it becomes even more so,” says pediatrician Myke Federman, MD, who is leading U Sleep at Ronald Reagan UCLA Medical Center, along with Theresa Kirkpatrick, MSN, RN, a clinical nurse specialist in the hospital’s pediatric intensive care unit.UCLA hospitals have undertaken a new initiative to improve the healing process for patients — one that involves no medications or procedures. U Sleep formalizes an effort that has been ongoing within individual units at Ronald Reagan UCLA Medical Center and UCLA Medical Center, Santa Monica to improve the quality and quantity of sleep by reducing nighttime disturbances both in and outside of patients’ rooms. Dr. Federman points to strong evidence on how sleep, or lack thereof, can affect the recovery process. She notes that poor sleep can contribute to a weakened immune system, which can reduce patients’ ability to prevent or fight off an infection. Research also suggests that lack of sleep may adversely affect cardiovascular and respiratory functions. In more severe cases, disrupted sleep cycles can increase the risk of confusion and even delirium among children and adults in the intensive care unit, Dr. Federman says. It also can interfere with patients’ ability to be proactive in their recovery process, such as participating in walks and working with the health care team on healing strategies. 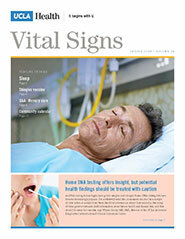 Unfortunately, hospitals traditionally have not been known as places that are conducive to solid sleep. In fact, Dr. Federman notes, the most common complaint of hospitalized patients, other than pain, is that disruptions outside their rooms and nighttime interruptions to conduct tests or monitor vital signs keep them from enjoying solid sleep. “As hospital technology has become more sophisticated and we have introduced all of these beeping monitors and interventions, it’s easy to forget that we need to address the basic needs of patients during their recovery, including sleep,” she says. Evidence of the importance of rest to the healing process was a major impetus behind U Sleep, says Karen Grimley, PhD, RN, chief nursing executive for UCLA Health. “This is something that individual units within the hospitals have been working on, but U Sleep pulls it all together into one organized program. Every unit now is accountable for developing and implementing processes to improve our patients’ ability to rest and get meaningful sleep, especially at night,” she says. The strategies are wide-ranging, Dr. Grimley notes. They include eliminating minor nuisances, such as squeaky wheels on carts that tend to awaken patients during the night, automatic doors slamming shut, and loud talking at the nurses’ station, as well as reducing noises at the bedside from beeping monitors, ventilators and pumps, and the bright lights emanating from computer screens. Each night in UCLA’s hospitals, at approximately 10 pm, an announcement reminds visitors and staff that it is bedtime and urges them to refrain from noise. Eye shields and earplugs are made available to patients, as is a station on their television that plays relaxation songs and sounds. Efforts also are being made to bundle nursing services in ways that eliminate unnecessary middle-of-the-night interruptions. “The health care of the patient is always the highest priority. But we want to make sure that we aren’t waking patients up if there is no clinical reason to do so,” says Vera Lopez, RN, director of the intermediate care unit at UCLA Medical Center, Santa Monica, where the program is known as Quiet Time. Patients are asked about their sleep habits when they are admitted to the hospital in an attempt to individualize their plan of care in a way that ensures their sleep needs are met, adds Lopez, who is leading the program in Santa Monica.